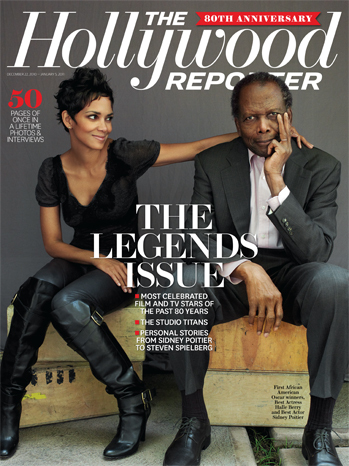 Sidney Poitier, James Earl Jones and Halle Berry are among the actors appearing in three separate covers of the Hollywood Reporter's 80th Anniversary "Legends Issue." For the special year-end package, THR brought together the biggest names in the business, both on screen and off, who have made a mark during the trade magazine's 80-year history. The covers feature three groupings of stars photographed together over the past two weeks. Consistently, the covers honor greats over the age of 80 with four exceptions (Debbie Reynolds, 78; James Earl Jones, 79; Larry Hagman, 79; and Halle Berry, 44). The legends issue is available to subscribers now, and at newsstands nationwide Friday, Dec. 17. * Cover 1: Ed Asner, Betty White, Larry Hagman, Eva Marie Saint, Mickey Rooney and Debbie Reynolds. Shot in L.A. by Art Streiber. * Cover 3: Sidney Poitier, with Halle Berry, represent the first African-Americans to win Oscars for best actor (1964) and best actress (2002). Shot by Peggy Sirota at Poitier's Beverly Hills house. I personally would have loved to have seen Denzel Washington, Whoopi Goldberg, Diana Ross, Angela Bassett, and Alfre Woodard on the cover, but I'm still happy for Halle. I just wished we had some better roles and support out there for other AA actresses that I feel are legendary but just get overlooked such as my personal favorites: Angela Bassett and Alfre Woodard. These women are phenomenal actresses, but yet they don't seem to garner the respect they deserve.